THE INSPIRATION FOR BLADERUNNER. . .
By 2021, the World War had killed millions, driving entire species into extinction and sending mankind off-planet. 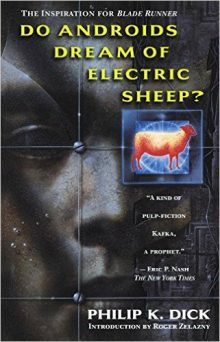 Those who remained coveted any living creature, and for people who couldn’t afford one, companies built incredibly realistic simulacrae: horses, birds, cats, sheep. . . They even built humans. Emigrées to Mars received androids so sophisticated it was impossible to tell them from true men or women. Fearful of the havoc these artificial humans could wreak, the government banned them from Earth. But when androids didn’t want to be identified, they just blended in. Rick Deckard was an officially sanctioned bounty hunter whose job was to find rogue androids, and to retire them. But cornered, androids tended to fight back, with deadly results.